Finally we have the logic for the Scheduler implemented. The basic workflow behind the main scheduling algorithm is based on the priority queue concept. When triggered, the program will begin to evaluate the existing objects or “jobs” and give every single one of them a score. This score mechanic is based on a number of constraints and settings like altitude , angular distance to the moon and starting/finishing time. After the best object was selected, the scheduler proceeds to execute the current job. The execution is based on program states (A clean asynchronous way of handling the code) thus code execution is never blocked. A new feature that was added is the FITS selection method. Instead of regular object selection, a user could now select a FITS image. The image will then be solved into a set of coordinates (RA/DEC) and the regular object will be constructed. My work for now on will consist in maintaining and cleaning up the code. I am certain that my experience with KDE will not end with GSoC. Big thanks to Jasem for his assistance and guidance. Stay tuned for the next update that will include a preview of the GUI which suffered small modifications during this last month :). This update is a little break from my current GSoC project so i won’t talk about my progress just yet. 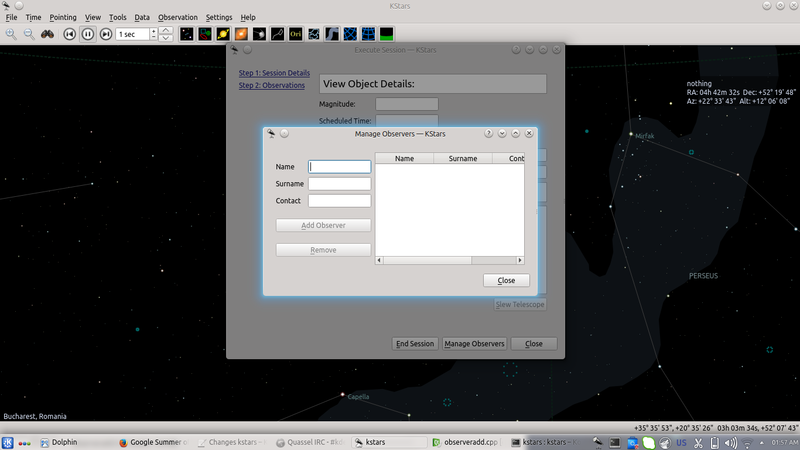 I will talk about the current observers management dialog that is currently active in KStars. Basically, an observation session requires observer information like first name, last name and contact. Currently, an observer could be added only from the settings menu so i thought that it would be more intuitive if this functionality was placed in a more appropirate place and a proper GUI was to be implemented for a better user experience. Now, the user has a heads on display on how many observers are currently in the database and has the possibility of managing that information. As of today, the coding period for GSOC has started. I can’t describe into words how excited i am about this summer. During the community bonding period i did not only got to know and interact with some of my fellow gsoc students, but i also used some of this break-time to sudy and get myself acquainted with the rest of KStars codebase. I won’t talk much about my project in my first post because i will keep you guys informed along the way but all i can say is that it will be a very interesting journey and the fact that i will be able to help and see this project grow is giving me a wonderful feeling. 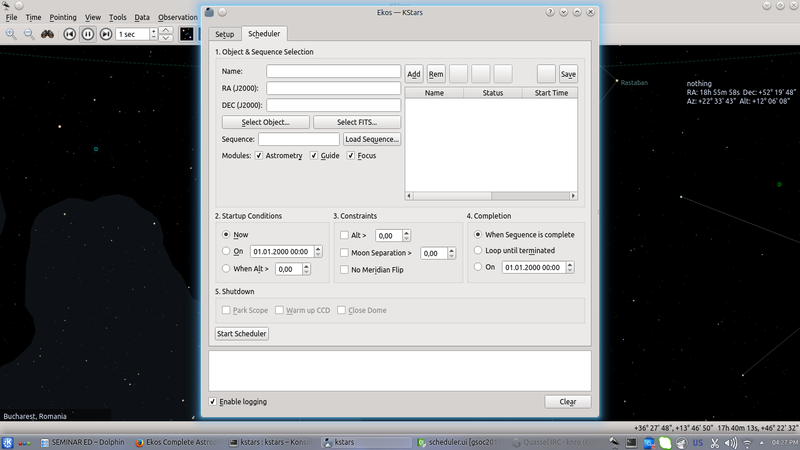 Basicly, what i have to do is a simple scheduler for Ekos. This will automate the process of astrophotography. The automation of this process will undoubtedly provide better astrophotography sessions and overall, raise the efficiency of the observatory. I will talk about some of my ideas in the next entries.